IFA 2017: SONY LF-S50G speaker with Google Assistant and Chromecast support announced. 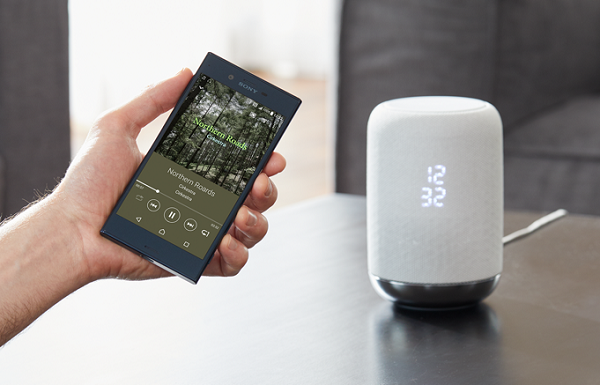 Sony Electronics announced today the LF-S50G wireless speaker combining Sony's high quality sound with the smart features of the Google Assistant built-in. The LF-S50G is a wireless speaker that can be used smartly in the kitchen with handy clock functionality and is IPX3 splash-proof design with a water repellant surface. The LF-S50G also supports gesture controls to begin playing music, skipping tracks, or adjusting the volume. With the Google Assistant built-in to the LF-S50G wireless speaker users can start playing music, turn up the volume, or skip to the next track just by using their voice, starting with "Ok Google". Users can ask the Assistant on LF-S50G wireless speaker for a weather forecast or traffic information, or simply to set a timer for the eggs. The Assistant on LF-S50G can also control a growing number of smart devices that can do almost everything from setting the perfect temperature to turning down the lights. Setting up other Google Assistant built-in and third party devices is easy using the Google Home app and a Wi-Fi connection. With a 360 degree, vertical two-way facing speaker system the LF-S50G wireless speaker can comfortably fill the average room with sound. A full range speaker clearly reproduces vocal and treble notes, a dedicated subwoofer reproduces bass sounds, and the omnidirectional two stage diffuser spreads the sound in all directions so that everyone can feel the natural bass sounds pouring out of a compact speaker while enjoying the same sound quality from anywhere in the room. The LF-S50G wireless speaker also support smartphone pairing via Bluetooth Wireless Technology and NFC. Speaker Size: Satellite Speaker: 48 mm, Sub Woofer: 2.09"
The LF-S50G Wireless Speaker has an MSRP of $199.99 and will be available in October 2017.